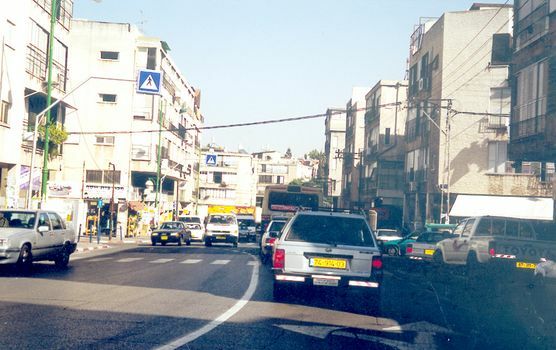 Jaffa, now subsumed in Tel Aviv-Yafo, is the old core of the modern city. 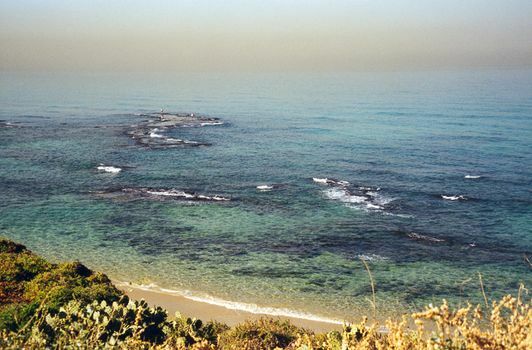 The hazy view from Jaffa west toward Andromeda's Rock. 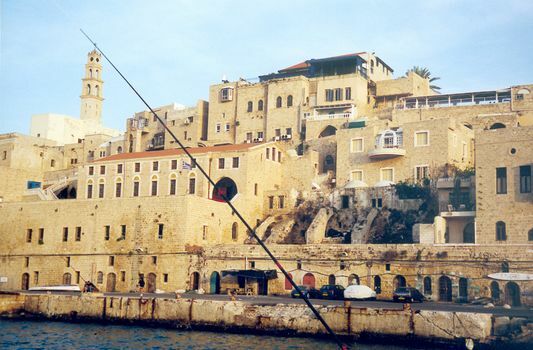 Through the 19th century, this was the very rough port of Palestine, with landings by lighter--and with luggage periodically lost in the brine. Old Jaffa seen from a breakwater. 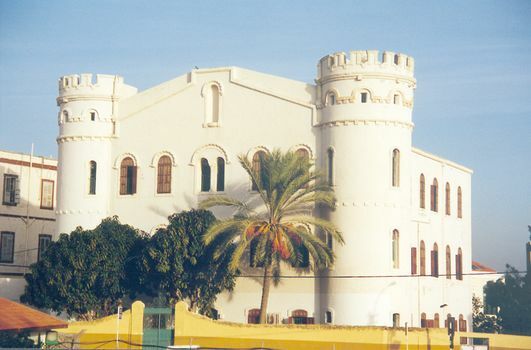 The city was compact and originally confined to a small hill rising from the coastal plain. 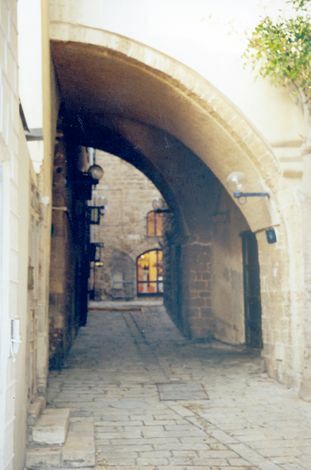 After 1948, the old city was deserted but later transformed into an artist's colony. 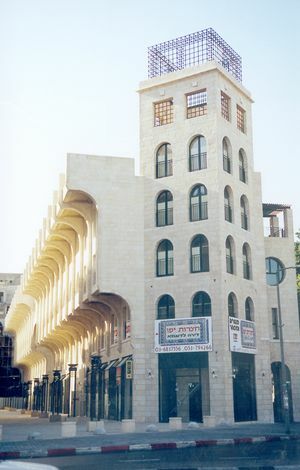 It's a common practice in Israel, where old Palestinian buildings offer architectural character hard to find in resolutely modern Israeli designs. 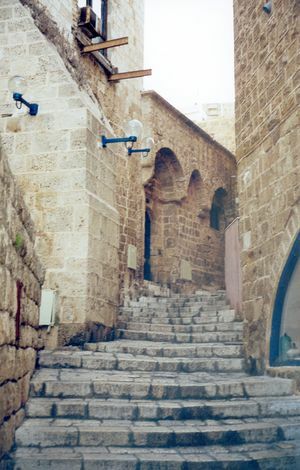 A stairway in the old city. The protruding I-beams are a relic of the British era, when they were introduced along with concrete. Economical for a time, they rust out long before stone buildings fail. 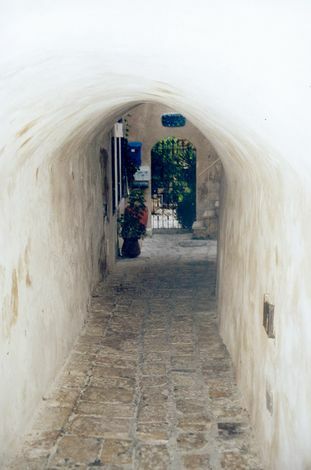 The stone is brought down from the hills south of Jerusalem. In a land without much wood, masons become expert at arches and domes. 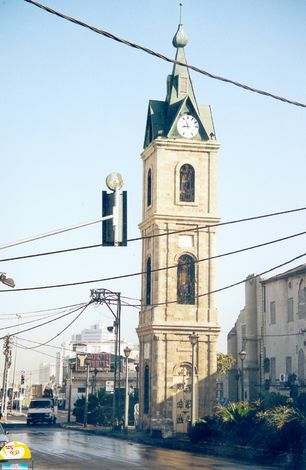 Just inland from Old Jaffa there's a Turkish clock tower much like the one in Akko and the one formerly at the Jaffa Gate in Jerusalem. The sultan in Istanbul had a thing for clocks, which makes you wonder if he was punctual himself. The wave of modernization symbolized so well by clocks shows up in other things, too, like this girls' school in Jaffa. It's just across the street from a French hospital, which, come to think of it, is another expression of the cultural tide. 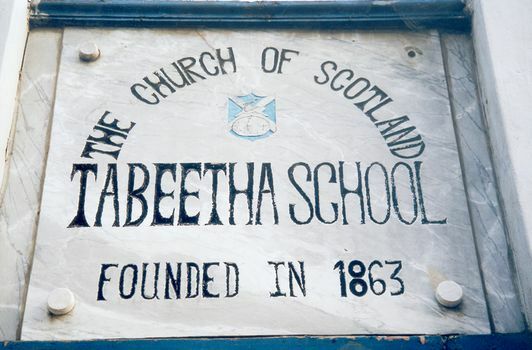 Here's the school, no doubt teaching Descartes behind the misleadingly medieval facade. 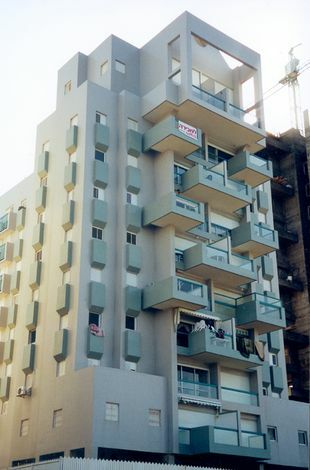 On flats surrounding the hill, 20th century Jaffa spreads out monochromatically but with a flood of sunshine. With an increasingly prosperous society comes the opportunity to play with style, even if it is only the Lego-look, here just a few blocks from Old Jaffa. 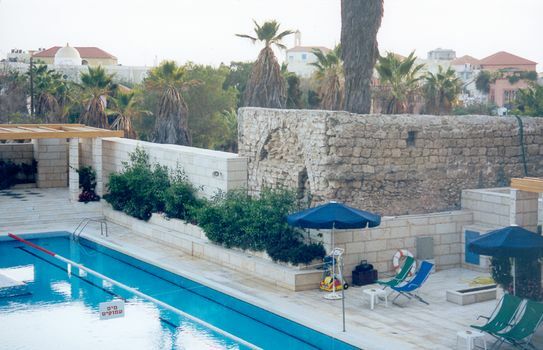 A different approach: new condominium apartments just south of Old Jaffa and trying to echo local tradition. Inside the same development, a bit of old masonry has been drawn into the design, as if to say that there was no break in 1948. 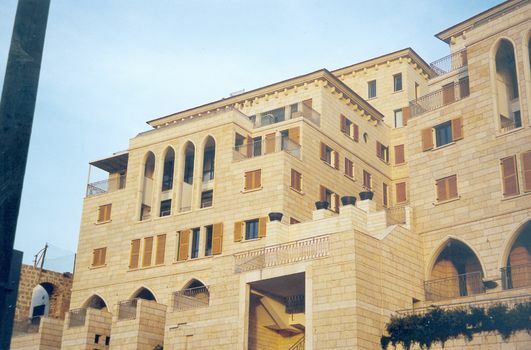 This office building looks around for something else to echo and settles on the sultan's nearby clock tower. 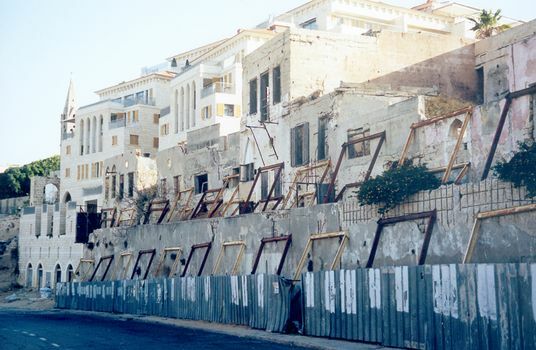 On the edge of collapse, old buildings await their conversion into the facades of new buildings.